During his State of the State Address, the Governor signaled his intentions to file a plan with the legislature to provide greater state oversight for schools deemed “failing” based on standardized assessments. By February, this plan was introduced in the form of Senate Bill 133 and Senate Resolution 287. His proposed constitutional amendment, modeled after oversight structures in Louisiana and Tennessee, would allow for the establishment of a new statewide superintendent who would implement a state intervention in schools with persistently low test scores. While the intentions of this proposal should be applauded, this plan will only result in the creation of a new layer of state government that removes local control from struggling Georgia schools, relies on a narrow, inadequate measure of school-wide achievement, and diverts funds from schools that have already suffered significant cuts. On March 5th, the Governor’s plan won approval in the State Senate with the minimum number of votes required. After moving through the committee process in the House, the Governor’s proposal will receive a vote on the House floor this week. Here, we catch you up on the latest from the House Education Committee’s vote, describe the student population most impacted by the proposal, highlight the weaknesses in the plan, and consider alternatives that would ensure greater local control for Georgia parents and their children. On Monday, the House Education committee voted to approve Senate Bill 133 and Senate Resolution 287, a legislative package that amends the state constitution to allow for the creation of a statewide “Opportunity School District”. This district would be comprised of schools that receive a grade of “F” for three consecutive years on the state’s education accountability system, currently known as the College and Career Readiness Performance Index (CCRPI). The Opportunity School District (OSD) would be allowed to assume control of 20 schools per year and maintain control of a maximum 100 schools at any time. In addition, the OSD Superintendent would determine the timing of school takeovers, hire a new principal in takeover schools, set goals for teachers and school leaders, and hold teachers and school leaders accountable if the OSD goals are not met. The OSD Superintendents would also have the discretion to retain current teachers after OSD conversion, based on the recommendation of the new principal. Accountability for OSD charter schools would be determined by the State Charter Schools Commission, but the OSD Superintendent would hire the charter school’s principal and governing board. Before a takeover plan can be adopted, the OSD Superintendent would be required to conduct an analysis of school performance over the previous three years. This analysis would be based on student growth and progress, availability of qualified partners, and community engagement and support. A public hearing is required is also required to solicit community input before a takeover plan can be adopted. Before staffing retention decisions are made, the OSD Superintendent, principal, or appointed governing board is required to interview all current teachers and review test score data for each teacher at the school. The Georgia Budget and Policy Institute points out that almost 92 percent of students in currently eligible schools are low-income and 93 percent of students are either black or Hispanic. Research indicates that students in high poverty schools face distinct challenges when compared with their more wealthy peers. GBPI notes that teachers in high poverty schools are less likely to have teacher certification in their subject area than are teachers in more wealthy schools. High poverty schools also face higher rates of teacher and principal turnover. Minority students also experience a different quality of education. U.S. Department of Education survey data show that black preschool students are more likely to be suspended than are their peers. English Language Learners are more likely to be retained in their current grade. Lastly, curriculum offerings differed in high minority schools with only 57 percent of black students attending schools with a full slate of advanced offerings while 71 percent of white students had a full set of options. As adopted by the House Education committee, the current proposal has significant gaps that exclude local communities from the decision-making process, rely on a developing accountability model, and divert more funding from schools which have endured cuts for over a decade. The Opportunity School District’s top-down approach takes accountability away from local officials. By placing decision-making authority in the hands of the OSD Superintendent appointed by the Governor, this approach removes current structures for accountability. Instead of being able to communicate with your local school board member, concerned parents potentially have only a single opportunity to present their views to the OSD Superintendent during a pre-takeover public hearing. Further, without an appeals process, parents who do not support the chosen intervention model have no outlet to seek changes to the new plans. The current accountability model, the College and Career Readiness Performance Index, is still being tweaked and is one of many factors that should be used to evaluate schools. While this model is designed to better measure growth than its predecessor, the formula has been adjusted in each of its three years of existence. In addition, evaluating schools based only on their CCRPI rating fails to identify successful interventions in schools facing the most serious challenges. While some schools may still receive grades deemed “failing”, interventions in these schools may be working. The current proposal requires the evaluation to consider growth, but sets no measure for how much growth is enough to avoid a takeover. That decision is at the discretion of the OSD Superintendent. 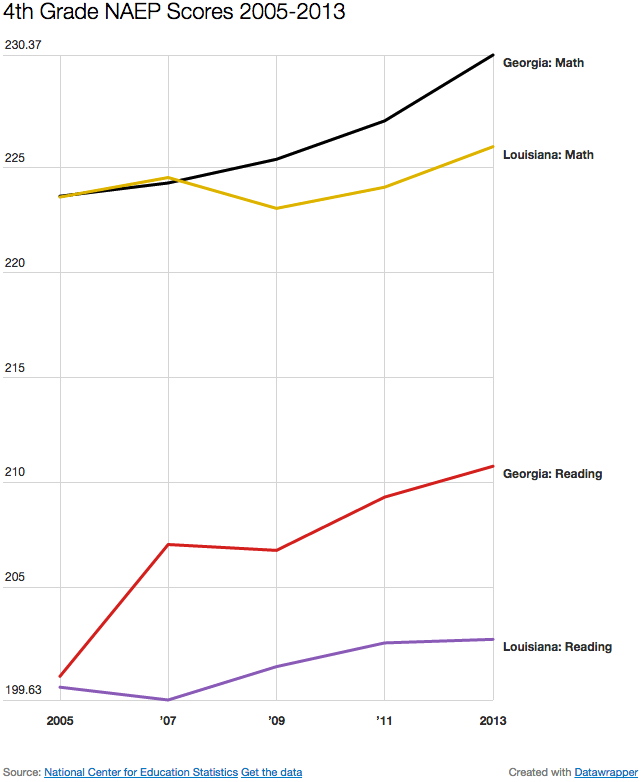 Test scores of low-income Georgia students increased at faster rates than the national average (and faster than those of Louisiana’s low-income students) between 2005 and 2013. Current interventions might be eliminated by a new takeover model, requiring teachers and school leaders to change course yet again. The OSD proposal is funded by withholding up to 3 percent of funding from the schools it takes over. Atlanta Public Schools, which has 27 schools currently eligible for takeover, has endured a 26.7% reduction in per-student funding over the last 13 years. This amounts to $1,160.30 less spent on each student. 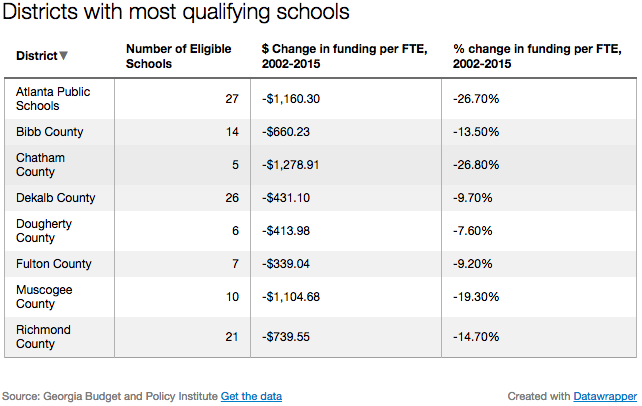 Other counties with 10 or more eligible schools, including Bibb County, Dekalb County, Muscogee County, and Richmond County, endured funding cuts at or above 10 percent of per student funding between 2002 and 2015. Funding for an additional layer of bureaucracy will come from struggling schools which have already endured over a decade of cuts. Lackluster improvements from the top-down, testing and accountability era established under No Child Left Behind have motivated the development of new approaches focused on local control. Like state takeover approaches, these local control approaches are still in their infancy. However, these approaches are based on a superior premise: increased community control and local decision-making in schools. One such reform is the enactment of the Local Control Funding Formula (LCFF) in California in 2013. This funding reform gives greater decision-making power to local authorities by requiring the establishment of two parental advisory boards, one of which is comprised of parents of English-language learning children. School districts are required to create a Local Control and Accountability Plan (LCAP) which allows local districts to devise strategies to meet state goals as well as establish their own. These plans must be reviewed by the two parental advisory committees, and the district superintendent is required to respond to advisory board’s comments in writing. Finally, the superintendent must inform the public of the opportunity to provide written commentary on the LCAP, and must hold one public hearing for oral comments. While proponents of OSD’s argue that the intent of the law is to enhance local control, the proposed legislation does not establish parental review committees or require community oversight. Authority over the establishment of the intervention model is granted solely to the Superintendent, and there is no review process once a model has been selected. Further, while legislators are allowed to reconsider the plan in future legislation, there is no legislative requirement for a review of the effectiveness of Opportunity School Districts. Enhanced community involvement and legislative oversight should be required before establishing a new layer of bureaucracy with control over local schools. This week, the House should vote no on the proposal to establish Opportunity School Districts in Georgia. Instead, the House should consider legislation that will enhance local control and provide desperately needed resources and support to our teachers and our local boards of education. Without local buy-in and decision-making, we cannot adequately address the needs of all Georgia children.